A highly available architecture that spans two Availability Zones. A virtual private cloud (VPC) configured with public subnets according to AWS best practices, to provide you with your own virtual network on AWS. An internet gateway to provide access to the internet. This gateway is used by the Varnish Enterprise nodes to send and receive direct traffic, mostly for inbound Secure Shell (SSH) access based on an IP range you provide when you launch the Quick Start. An internet-facing Network Load Balancer to distribute HTTP or HTTPS traffic to Varnish 6 nodes. 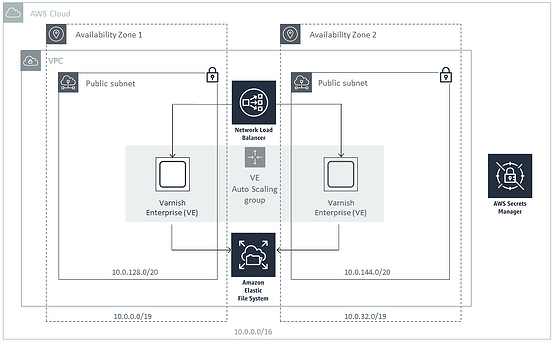 In the public subnets, a Varnish 6 host in an Auto Scaling group to allow inbound HTTP and HTTPS traffic via the Network Load Balancer. An Amazon Elastic File System (Amazon EFS) Network File System (NFS) share point. Varnish High Availability (VHA) agents use this mount point to synchronize Varnish node information. The Quick Start uses Ubuntu Linux as the operating system for the Varnish 6 instances and includes AWS CloudFormation templates & guidance that provide step-by-step instructions to help you get the most out of your deployment.